Vermont Senator officially launches his campaign for the White House, hoping to challenge Democratic frontrunner Hillary Clinton. Senator Bernie Sanders on Thursday officially launched his populist, liberal campaign for the White House, savaging an American economic system that creates "immoral" and unsustainable disparities between rich and poor, according to AFP. "We're in this race to win," the 73-year-old Sanders, an independent lawmaker who is little known outside political circles and his home state of Vermont, told reporters at a low-key, rushed announcement on the lawn outside the Capitol, where he has served in Congress since 1991. By jumping into the presidential race, the self-described socialist Sanders presents a long-shot challenge to Democratic frontrunner Hillary Clinton but said he relishes the chance to go toe-to-toe with her in "serious debates over serious issues -- not political gossip." "Ninety-nine percent of all new income generated in this country is going to the top one percent," he said Thursday. "That type of economics is not only immoral, it's not only wrong, it is unsustainable," he added. He reiterated his fierce opposition to a massive trade pact under negotiation with Asia-Pacific nations, saying the deal would cost American jobs. He eventually won a seat in Congress in 1990. He voted against authorizing the use of military force against Iraq in 1991 and again in 2002, when Clinton voted in support of the Iraq war resolution. Sanders recently made headlines when he became the first senator to announce he would not be attending Prime Minister Binyamin Netanyahu’s speech before Congress. “The president of the United States heads up our foreign policy. The idea that the president wasn’t even consulted — that is wrong and not a good thing for our country,” Sanders said at the time, referring to the fact that House of Representatives Speaker Republican John Boehner invited Netanyahu to make the speech without the knowledge of either the White House's or Democratic leaders in Congress. “I’m not thinking about it. I’m not going. 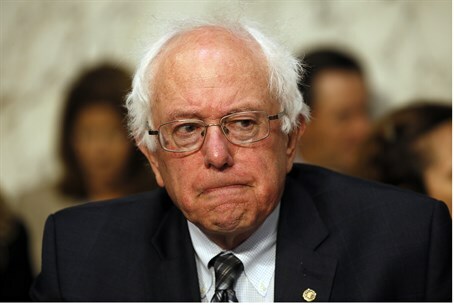 I may watch it on TV,” Sanders stressed.